This software development kit contains everything needed to get started with secure MULTOS application development on smartcards. MULTOS cards can run multiple applications for a wide range of uses including payments, ID, transit, mobile and IoT. These applications are typically written in C, and the development kit includes full reference documentation, training materials and code samples as well as the required Eclipse development environment toolchain plug-ins. 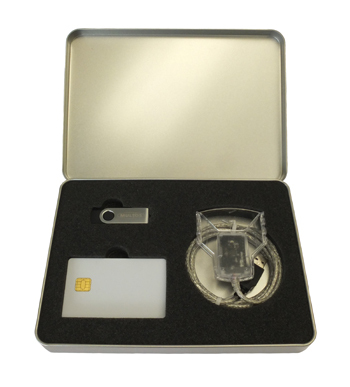 The kit also includes a Gemalto IDBridge CT30 USB smartcard reader and two 36K MULTOS contact-only community developer cards that have been enabled on the MULTOS Key Management Authority (KMA) which allows for applications and data to be securely loaded onto the cards in an insecure environment. Further supplies of these cards are available from our online store, and other card types are also available on request.